The building is located in Alicante, a city on the south-east of Spain, which is notable for its mainly horizontal and low skyline, with only three significant tall buildings which compete with the Santa Bárbara Castle, the tallest building in de city. Our building seeks to complete the skyline, turning it into the tallest one but always respecting the castle. In the city, the building will be situated in an area which is now being transformed, where the removal of the current railway track station that is taking place, will turn this area into a big central park. Hence, the building attempts to be the main access point to the new park and to act as a transition from the park to the city. Rejecting the traditional model of an only vertical tower, the project proposes two twin different towers connected to each other by a basement that forms a continuous façade in ground floor. 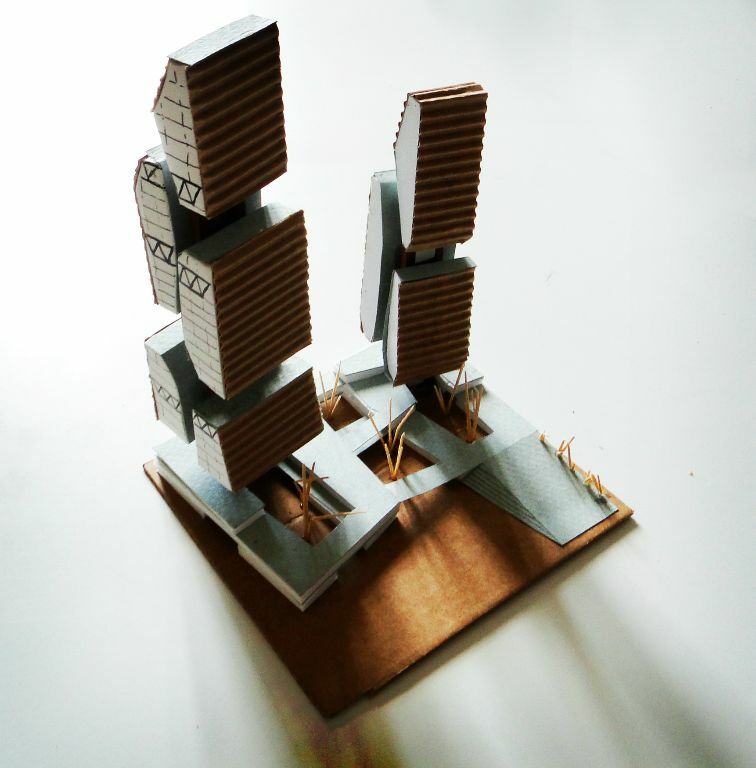 The different height of the two towers favors the integration of the building within the environment. 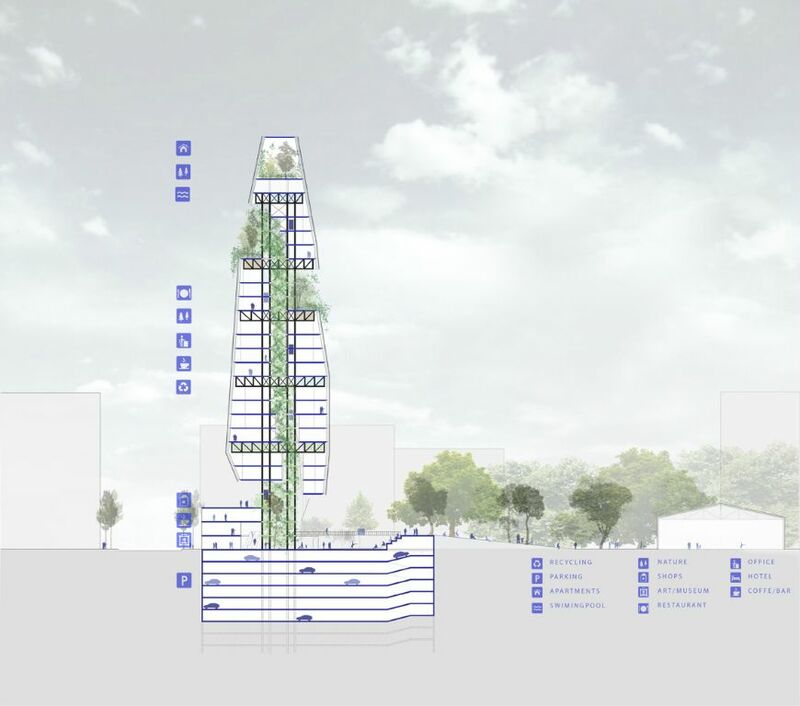 The main tower works as a point of reference while the low one relates with the neighbor buildings. The basement makes the transition from the city to the park which is achieved by creating two façades; a vertical and continuous one with strategic accesses from the shopping street, and another much lower and permeable façade, with small ramps and green stairs which provide continuity to the park until the roof of the basement. 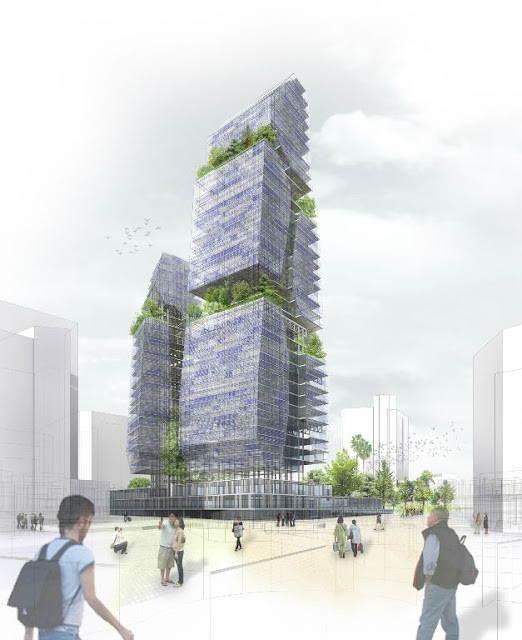 The continuity of the park moves from the heart of the building until the highest part of the towers, by means of a central yard which will generate natural ventilation, reducing the temperature of the building. 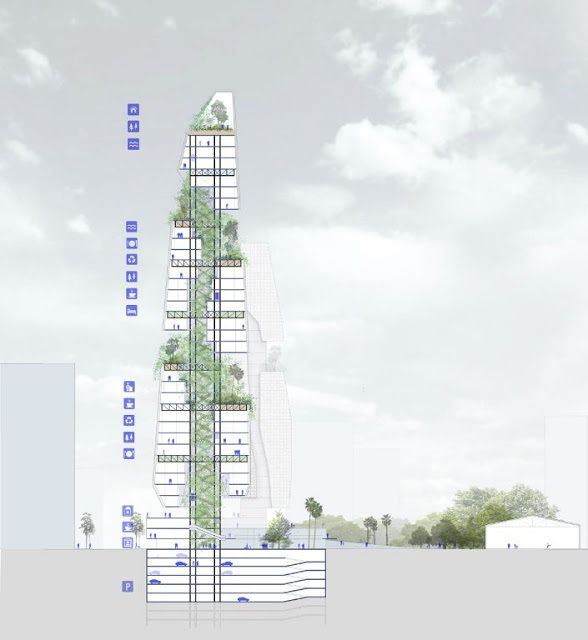 Climbing plants, placed on this yard, will colonize the structure, thus the green way will go up and, in some places, it will go out to the exterior of the building through spacious viewpoints. 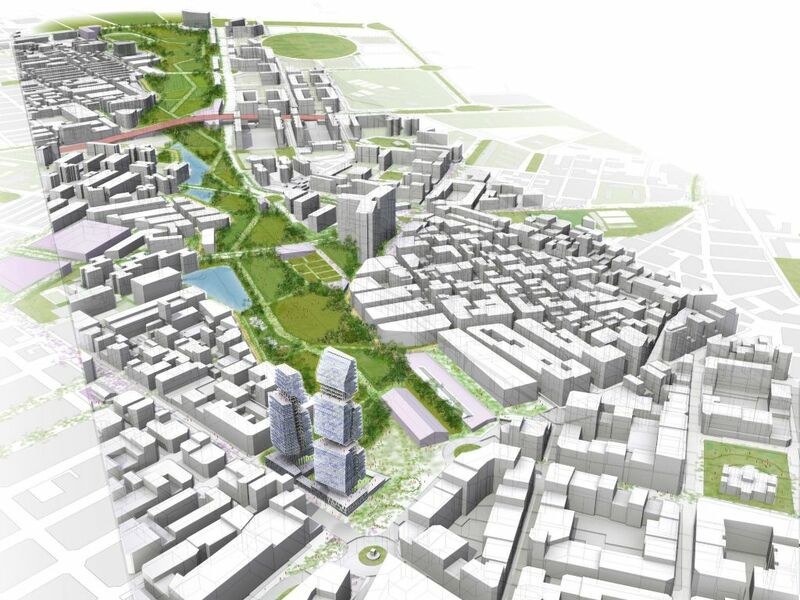 These viewpoints, where big trees will be able to grow, will be strategically placed seeking the best views of the city and the highest amount of sunlight. The making of these spacious viewpoints are possible thanks to the structure of the building, which is composed by a system of big central pillars with metallic truss leaning over them. Struts hang from these truss making the framework hang, so that, the viewpoints can be pillar-free. The free space is used to host, depending on the situation of the truss, machinery, waste treatment plant, or fertile land spaces to grow plants and trees. The proposal opts for the creation of a multidisciplinary area hosting shops, restaurants, offices, hotels and luxury apartments. 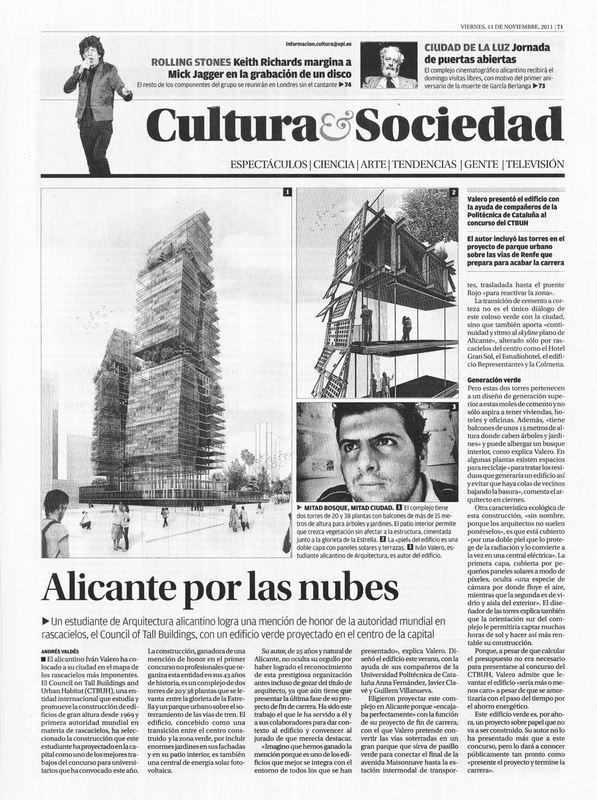 Combining workplace and dwelling will favor communal life, as the aim of the project is to create a public space where people will interact with each other at all times. 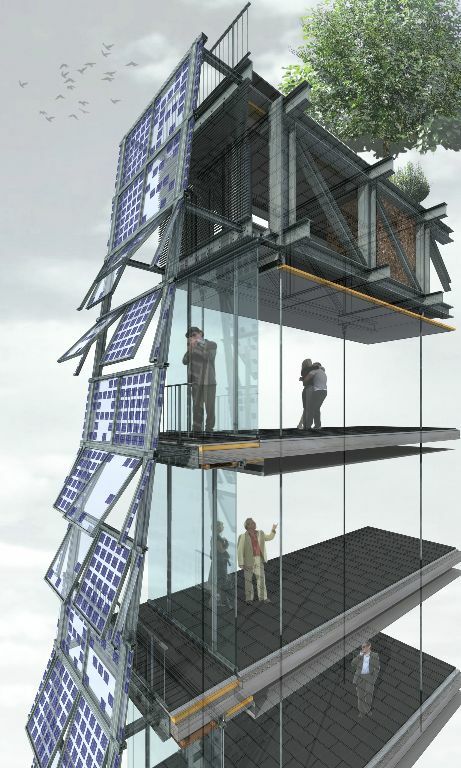 The exterior skin will counteract the effects of the high level of solar radiation that the building will have to withstand due to its radiation. This skin, will act as a sunshade and protect the façade which, depending on the season, can be permeable (ventilation) or closed (greenhouse effect). The skin consists of square pieces which rest on vertical girder and are formed by a low emissivity glass with photovoltaic cells which provide shadows (passive sustainability) and produce energy (active sustainability), so that the building becomes a solar energy electric power station, capable of being self-sufficient and providing electricity. The density of the photovoltaic cells of these square pieces obtains a system of pixels which goes from a dark blue color to a light blue one. The combination of these cells makes the skin of the building looks like the sea waves situated in front of it.